Summer at Pearson is indeed a magical time! From the annual MISSA arts extravaganza, to summer programs full of youth leadership, laughter and friendship, to hosting on-campus weddings and to the joy of alumni reunions; magic is in the air. But that’s not all of it. The last of the summer programs casts a special “SPELL” over the campus as we ease from summer into fall mode. SPELL — the Summer Program for English Language Learning — is a 10-day program of language learning support for first-year students. This year, eight first-year students, accompanied and supported by five second-year students, took this opportunity to gain confidence in their English skills before their co-years arrive. While first year students have four hours of class every day, the second years have time to work on their Extended Essays and can access support from the SPELL leaders Kim Meredith, Faculty member for English Language, and Jamal Cox, our new Library and Learning Support Tutor. This year, SPELL coordinators and participants are assisted by volunteer Alba Carod, who is from a small village in Spain and an experienced counsellor and educator with a master’s degree in international education. 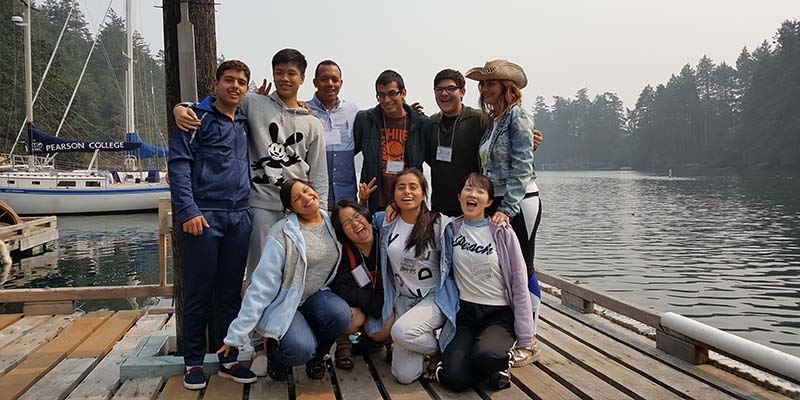 In class, students practice their English skills in a variety of settings, ranging from grammar and vocabulary exercises to discussing specific topics such as local wildlife, interviewing staff and faculty and working on group presentations. Second year students are in charge of leading the afternoon activities, whether it be sports activities, a walk to Weirs Beach, Bay Jumps, a trip to Race Rocks or a photo scavenger hunt. All those activities are geared to increase the students’ comfort levels in their language skills, as well as their familiarity with their new home, and it gives them a head start on making new friends. Second-year students also put their leadership skills into action and become role models for the incoming cohort of first-year students.